The Good Dinosaur may not be the best Pixar film, but there is no doubt that it has a very interesting story line and touching ending. I admit that I’m a fan of all the Pixar movies, and I love them. So what can you learn from The Good Dinosaur? If you haven’t watched the movie yet, go ahead and watch it. If possible, watch it with your friends or with your children. If you have watched it, great, continue to read on because I’m going to share with you the 7 best quotes and lessons that I’ve learned from the movie. This is what Arlo’s father told him when he was scared. Even though Arlo is a Longhorn dinosaur, he grew up slow, and he has a small body size compared to his siblings. Thus, he is always scared of things, even chickens. Yes, a dinosaur who is scared of chickens. And one night, his father brings him to the outskirt and shows him the fireflies in the grassland. His father, Poppa, then tells Arlo that he has to get through his fear to see the beauty on the other side. It is the same in life. You have to get through your fear to see the other side. Nothing ventured, nothing gains. Man has to dare to lose sight of the land if he wants to discover new oceans. If you are not living the life you want, you have to conquer your fear and get through your comfort zone to do things that you have never done before. You have to understand that fear only appear in your mind, and they are not real. 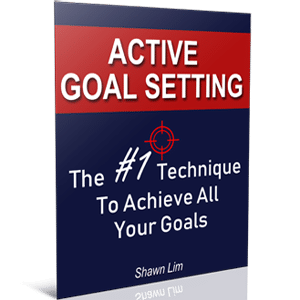 Imagine living your life in your comfort zone, going through and doing everything the same way each day, how would you feel after 10 years down the road? Would you be excited with your life or would you feel bored and lived through the 10 years like a zombie? Most people are scared to death, and they don’t dare to venture out of their comfort zone. They rather die in fear than to take a leap of faith and do what they want in their lives. If you want to be successful and join the extraordinary, you must dare to do things differently. You must dare to journey into new grounds and do something that makes your heart sings. The problem with most people is that they tend to follow the crowd and do what others did instead of following their intuition and chase their dreams. This is why many people are living in mediocrity, going through life chasing money and trying to pay their bills. They get stuck in their job, and they don’t dare to listen to their hearts and go after their dreams. Years ago when I decided to start my own internet business, I was scared too. I kept asking “What if I fail” or “What if I cannot make it”, but somehow, I gathered my guts and took the leap. I made the decision to start my own internet business and commit to doing it until I get the results I want no matter what. And this is how this blog was born. Please understand that fear is everywhere. No matter whether you are working for someone else or are running your own business, there will be fear and problems you need to face as long as you are alive. People who are holding a job have a fear of losing their jobs and worry about money. People who are running their businesses fear of losing their businesses and worry about their business performance. Fear is everywhere. Instead of letting it stops you, choose to go through it and do something worthwhile with your life. One of the most important lessons I learned from The Good Dinosaur is that everything takes time. Arlo tried to leave his mark, but somehow he did not manage to do it until the very end of the movie. He tried his best but somehow, the time is just not right, and he failed. The same goes in life. Sometimes you try to do something and pour in all your effort and time, but somehow, the result is not what you want. Tell yourself that you don’t have to worry about how things will work out. All you need to do is to do your best and commit to the progress, not the result. As a blogger, I constantly commit to publishing something worthy for my readers to read, but sometimes things will never turn out perfectly as what I imagined. I will just tell myself to move on and continue to work harder. The universe and God know your effort; the result will eventually come. When Steve Jobs was fired from Apple, it seems to him that it was his darkest moment in that time. Nobody knows that he would go on to buy Pixar and found Next Computer and eventually got back to Apple. He said that the event of being fired by Apple became one of his best moments in his life when he looked back many years later. Thus, we cannot know what will happen in the future. All we can do is to do our best at this moment and trust that everything will turn out fine. It is alright if you did not achieve your goals or fail to reach your dreams today, God has something better in store for you in the future. You just need to believe in it. 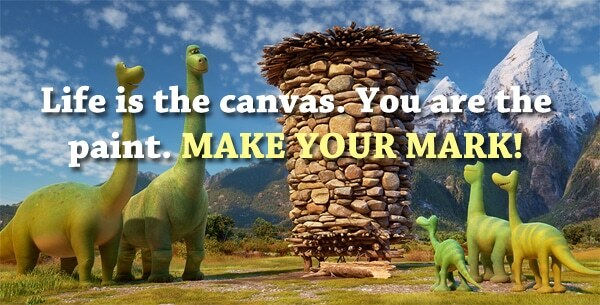 The Good Dinosaur is a movie that inspires and filled with a lot of life lessons. Arlo and his siblings were taught to leave their marks by contributing to their family. They need to do something worthwhile to be able to recognize by their parents and leave their marks. What about you? Have you made your mark? What do you want to do with your life that will contribute to your family and the world? Of course, you don’t have to start off by traveling around the world and saving people; you can always start small by contributing to your family. What have you done to serve your family and make it a better place? Remember, your family is where you were born, and it is where you learned everything since young. Therefore, value your family and do something worthwhile to contribute to your family members. If you watch the movie, you will see that Arlo was scared in the beginning after he got lost. He was scared of everything. However, after some time down his journey of getting home, he started to get used to his venture and slowly enjoy the journey. Are you enjoying your journey called life? You must learn to dance in the rain. Like what I have mentioned above, there will be problems no matter who and where you are. People who are poor have their problems and people who are rich have their problems too. So instead of living in fear and worrying about the problems, choose to embrace the problems and live with them. No matter how the time will pass, and you will still need to live. Hence, choose to enjoy each moment rather than living in fear and constantly worrying about things that haven’t happen yet. 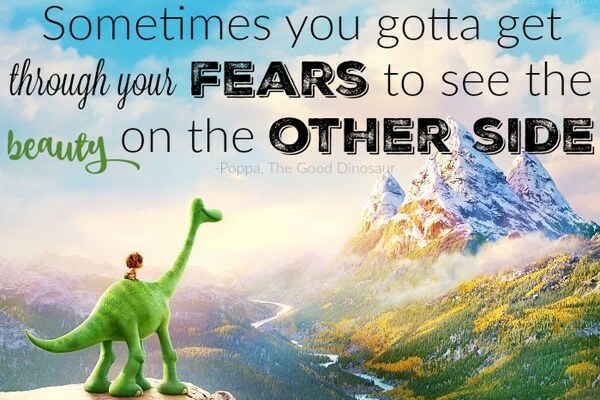 Another lesson I learned from The Good Dinosaur is that we are often more powerful and stronger than we think we are. Most of us live through lives never truly unleash our greatness within. We are powerful beyond measures. To prove this, look at what humanity has achieved. We have traveled to the outer space, we created submarines to dive into the deep sea, we invented airplanes that fly through continents, and we have created the internet that connects us across the world. We have the capability to achieve great results in life. You have the greatness and the ability to live your dreams if you dare to go for them. So never underestimate your ability and talents. Do you know that the biggest failure in life is not to believe in yourself and your ability? It is not that you don’t have the talent or the knowledge or the time or the money, it is that you choose not to believe in yourself that makes you the biggest failure in life. Anyone can achieve anything they want as long as they believe and set their mind to accomplish it. So trust yourself and believe in yourself. You are stronger than you think you are. Finally, you have to value your relationships with everyone around you, especially those who spend their lives with you. In the movie, Arlo and Spot created an intimate relationship, and they both go through all the challenges on their journey home. Towards the end of the movie, Arlo and Spot have to part ways, and it is the most touching scene in the movie. If you feel touched, it simply means that the movie has successfully created the bond between Arlo and Spot that makes you feel sad. And like Arlo and Spot, you have to value your relationships with people around you. You will never know what will happen in life, so make every moment counts and value the people around you. The movie is a must-watch. Even though some scenes are predictable and a little bored, but it is a great movie nonetheless. These are my best The Good Dinosaur quotes and lessons. What about yours? If you have watched the movie, do share your opinion in the comment section below. Tell me how the movie has inspired you and what you think about this article. And remember to share if you like what you read here. Enlighten others and brighten up people’s lives through sharing. >If you ain’t scared, you ain’t alive. The first quote caught my attention is “sometimes you have to get through your fear to see the beauty of the other side”. We have our fear, but by remembering our fear / pain, it makes us tough to march forward. The other quote is “you are me, more than I am”. We always admire our parent is strongest person in the world, but when we are ready, ready to protect our loved one, we will be strong too! Thanks for the nice quotes sharing!